Dr. Cindy Layport has been in private practice in Portland since 1990 when she purchased Dr. John Derbyshire's practice. She was raised in Coos Bay, Oregon and graduated from Marshfield High School and Stanford University. She received her DMD from Oregon Health Sciences University in 1987 and her Certificate in Periodontics from the University of North Carolina at Chapel Hill in 1989. She is married and has a son and daughter. Her family enjoys skiing and whitewater rafting. 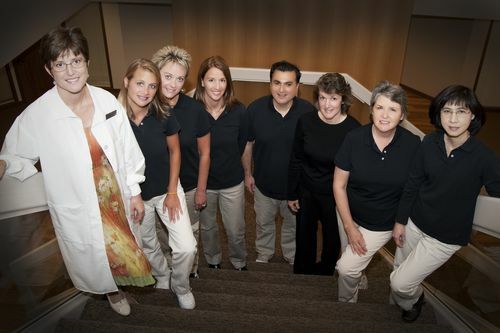 Dr. Layport is an active participant in many dental organizations. She is a past president of the Washington County Dental Society, the Oregon Chapter of Delta Sigma Delta Dental Fraternity, Dental Aid for Children, Oregon Women Dentists, and the Oregon Society of Periodontists. She was published in the July 1990 Journal of Periodontology with her graduate school paper entitled "Alveolar Bone Loss and Long-Term Supportive Care."